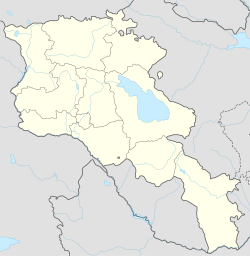 Beniamin (Armenie: Բենիամին; till 1945, Jlovkhan or Chlokhan) is a veelage an rural commonty (municipality) in the Shirak Province o Armenie. The toun wis renamit in 1945 in honor o Beniamin Galstian, a Warld War II general an native o the toun. The Naitional Statistical Service o the Republic o Armenie (ARMSTAT) reportit its population wis 745 in 2010, up frae 702 at the 2001 census. ↑ "Marzes of the Republic of Armenia and Yerevan City in Figures, 2010" (PDF). Naitional Statistical Service o the Republic o Armenie (ARMSTAT). This page wis last eeditit on 10 Mairch 2018, at 20:23.